17.1Help Gostica raise the vibrations and SHARE this article with your family and friends. There are many ways to define how good you are in each types of Magic. One is astrology. You Zodiac sign can say many things about you especially when it comes to what you like and how your personality is prone to certain types of magic. Types of Witches can be categorized according to their Zodiac Signs as the Sun’s position in the Natal Chart shows the energy of the newborn child. This comes from the fact the the first sign of the Zodiac is when Fire gets its power back. The Sun enters the Spring Equinox and nature is reborn. In their blood, waves of energy is ready to ignite their passions. If you are an Aries try this! From all the Types of Witches they are the ones with the most versatile nature. Energy is like the wind and it always changes direction. Like their mood swings they can turn up-side-down of all energy. They can transmute negative to positive energy and vice versa depending on their emotional background. Their adventurous nature make them great in manipulating astral energy. If you are a Gemini try this. As we already saw the stomach of the Cancers are really sensitive as it is the part of the body which dilutes and transmutes energy – just like the kitchen. They have the amazing ability to give their lunar blessings to everything they want and touch. The Tides of the moon enchant their potions and their spells. If you are a Cancer try this. From all the Types of Witches, this is what defines them: art and inspiration. Of course they need balance and harmony in order to work their magic. To do so, the need to find a way to center themselves. Only this way they will learn how great they are. If you are a Libra try this. Compose tonight a simple spell and cast it with music of your own! Witches born under the sign of Leo have a natural ability to catch the attention of others making them extremely talented illusionist. They can easily hypnotize people / animals and charm them. 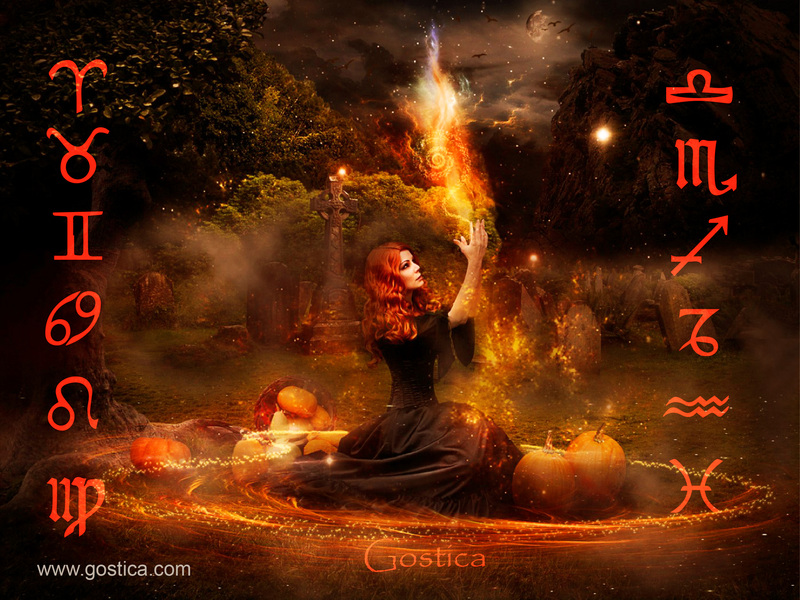 Witches born under the sign of Virgo are extremely potent in magical practice as long as they can remain focused. They tend to re-invent their magical self in the silence of Nature, whether this is the Green Woods or the peaceful Emerald Seas. Virgo – as the name implies – the Virgin / the Untouched, needs time for themselves. From all the Types of Witches, they are the ones who need to find a way to explore the richness of their powers by their own. Only when alone they find their true potential. Once they do they can get back to being awesome in their social circles. If you are a Virgo try this. Grounding can help them banish negativity. Go somewhere you feel secure and lonely (preferably in a Forest or near the Sea). Breathe for few minutes and cast a spell. Witches born under the sign of Libra are blessed with inspiration and are usually extremely talented in arts and crafts. Libra Witches can easily compose spells and even sing them empowering their magical vibes from all the Types of Witches, this is what defines them: art and inspiration. Of course they need balance and harmony in order to work their magic. To do so, the need to find a way to center themselves. Only this way they will learn how great they are. If you are a Libra try this. Compose tonight a simple spell and cast it with music of your own! Witches born under the sign of Scorpio feel inspired and “enlightened” during the midnight hours, when silence prevails and darkness asserts its dominance. Do not confuse darkness with evil. Scorpio are just great perceiving what’s hidden. What is hidden and secret ignites their curiosity and wakes up their powerful instincts. They have this amazing ability to scratch the surface in order to find what’s hidden underneath. This is how they learn so many things. From all the Types of Witches astrology defines them as the Wisest of the Zodiac. They may fear but they try to push fear behind. If you are a Scorpio try this. In the Midnight, go outside in a safe and lonely place. Look up the skies and talk to the night about your desire! Witches born under the sign of Sagittarius are the children of Zeus / Jupiter / Thor, the God of Thunder. They have a great ability to direct a very “thick” and focused current of energy towards whatever they desire. They are wise and fair and they can cast really powerful magic. From all the Types of Witches, Thunder Witch is the one who can push further and break the chains throughout wisdom and optimism. Where thunder strikes everything is possible. If you are a Sagittarius try this. Focus on your hands and think and re-think your desire over and over again. When you feel ready express your desire like a thunder bursting from you hands towards your target. Here you will find how to direct energy. Saturn the so called “Planet of Witches” governs Capricorn giving them the ability to command elemental forces with love and discipline. If you are a Capricorn try this. Go out for a long walk and search for that “special tree” you feel connected with. Embrace the tree and become one with it and once you are ready send some magical energy to the future in your career / shop or wherever you work. Here you can learn more about grounding! Witches born under the sign of Aquarius are very well attuned with the orbs of the planets and stars. Once they look up in the night sky they just know that they are a part of something greater and although they know a little about it they can successfully direct star energy into this World. The Stars is like a giant web where they a part of it. By looking at the stars, Aquarius knows and feels s/he is never alone. All are connected. Past, Present and Future. Thus, everything is possible. If you are an Aquarius try this. During the night, got out and talk to the stars about your desires! From all the Types of Witches, a Fairy Witch is the one who live in this world but definitely belongs to another one. Not a single Pisces actually feels 100% ok with the material world. They all know deep inside that they are missing the greater truth. Thus from a really young age are trying to visualise and locate the world they really fit in. If you are a Pisces try this. Plant some Foxglove near your house and every morning invite the spirit of nature to come and live.